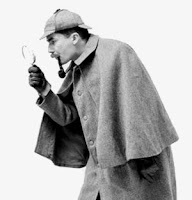 So, prior to Xmas I was reading reviews of the new Robert Downey, Jr. movie, Sherlock Holmes. (As a dyed-in-the-wool Holmes fan, of course, I had to see it. First showing on opening day. Loved it.) In almost every single case, these movie critics (fodder for another post, for sure) were very quick to insert that "true Holmes fans won't like it." Hum. That's odd, don't you think? The theatre world has been re-imagining Shakespeare for centuries and this same fraternity of critics would shout "Daring!," "Imaginative," Brilliantly accessible." But make Sherlock a little bit more fit and Watson a little more svelte and somehow you've stepped on someone's literary dog. I also, take historical umbrage at the comments by reviewers of the Holmes/Watson apparent man-crush in the Downey film. I would respectfully remind our learned critics that this was Victorian England. True, there was an emerging femist movement, but let's face it -- men and women were not exactly on equal terms. Men went to "gentlemen's clubs" for companionship. They didn't stay home and chat with the missus. Women were little more that property. So under the filter of the times, perhaps that relationship between Mr. H & Mr. W. is not so far removed from reality. In my humble opinion "real" Holmes fans will absolutely enjoy this new take on the sleuth. I still enjoy Basil Rathbone and Jeremy Brett is forever my personal favorite Holmes. But now we have a version that dares to do something different. This film dares to be contemporary. It's a good action movie, is beautiful to look at as a film, pays attention to detail, is wonderfully costumed and has excellent actors giving excellent performances. I'll spend 12 bucks on that -- and Look forward to the sequel.